1.7.2: The Oldest Photo of Lynchburg? Happy Lee was the playground director at Miller Park, which is located in the center of the City of Lynchburg. 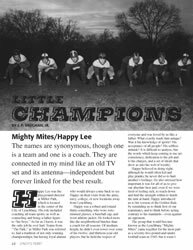 His role included coaching all team sports, as well as counseling and being a father figure to “his boys.” As far as I know, it was the only job he ever had. Teams from “The Park,” as Miller Park was referred to, had a tradition of not only winning championships, but having loyal alumni who would always come back to see Happy on their visits from the army, navy, college, or new locations away from Lynchburg. J. P. Vaughan, Jr. was born on June 26, 1935, the only child of Joe and Ora Vaughan. The family lived on Park Avenue in Lynchburg. J.P. spent most of his adolescent years at nearby Miller Park with his many friends and his mentor, Happy Lee, playing sports and enjoying an idyllic kind of boy’s life. He graduated from E. C. Glass in 1954—the first class to graduate from the new high school, and went on to Hampden-Sydney College where he graduated in 1957. J. P. has worked at Coldwell-Banker, Forehand and Company Realtors for over forty-five years. He and his wife Kay have six children and sixteen grandchildren between them. Kay was intrigued with the Mighty Mites story and encouraged J.P. to write it down for his children and grandchildren. Previous page: The Oldest Photo of Lynchburg?